This very interesting item has been put forward for discussion from ‘Steve AKA theraggedtiger’ and it’s something I’ve certainly never heard of before. 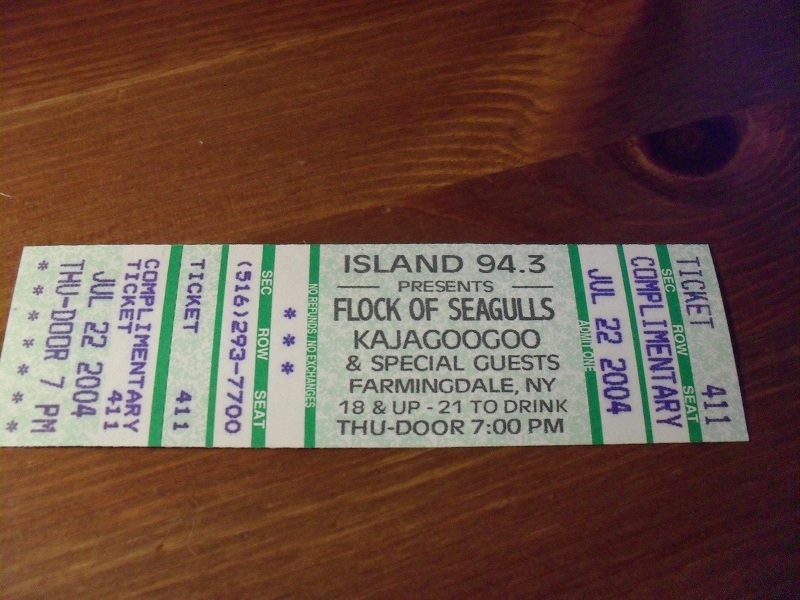 So here we have a ticket for a concert from July 22nd 2004 which seems to feature KajaGooGoo on the bill with A Flock of Seagulls in Farmingdale, New York. This one is very confusing! After the VH1 Bands Reunited show of 2003, I was not aware of anything like this happening, especially not in New York. So, can anyone confirm whether this actually happened? Who played as KajaGooGoo on that night? Did anyone go to this show? Let’s try and solve this mystery!! I don’t remember this one, I recall the Nike Chicago one where there were work permit problems. I remember this too as I was planning a trip to Chicago to go to the concert, then it got cancelled. Nike Chicago, when was that supposed to be Lee? Here we go, interesting! http://www.regenmag.com/News-858-Kajagoogoo.html That article was 2006 and spoke about those shows being next year eg 2007, so the 2004 thing is still mysterious. The article does say about work permits and giving the lads a break this time, so maybe 2004 was that problem. So if this was the case, it could mean that a) the promoters here confirmed the line-up and released the tickets BEFORE the band had a work permit to actually be there and b) soon after the failed reconciliation attempt after the VH1 show, the band (in some guise) were going to head out and play again. New information, new post coming up! We now know that this ticket was part of a line up of dates for a 2004 US Tour that never happened due to work permits. This ticket is a bit of a find really!! I have à t-shirt fr.o.m. The 2004 Nike tour!! !